This page describes the Devonian Period, including stratigraphy, paleogeography, and famous lagerstätten, followed by a sketched outline of some of the major evolutionary events. Fishes are the dominent animals; scale tree forests appear on land, inhabited by the first wingless insects; blastoids are at their peak; the first ammonites and amphibians evolve. The Devonian was proposed by Adam Sedgwick and Roderick I. Murchison in 1839 (Sedgwick & Murchison 1839). The type section is in Devonshire; its boundaries are based mainly on fossils. The base of the Devonian is defined immediately at the first appearance of the graptolite species Monograptus uniformis in the rhythmically alterating limestones and calcareous shales of ‘Bed 20’ in the Klonk Section, which is located near the village of Suchomasty, about 35km southwest of Prague in the Czech Republic. The age is established at 419 ± 3.2 Ma. ICS (Cohen et al. 2015) from 419.2 ± 3.2 to 358.9 ± 0.4 Ma. 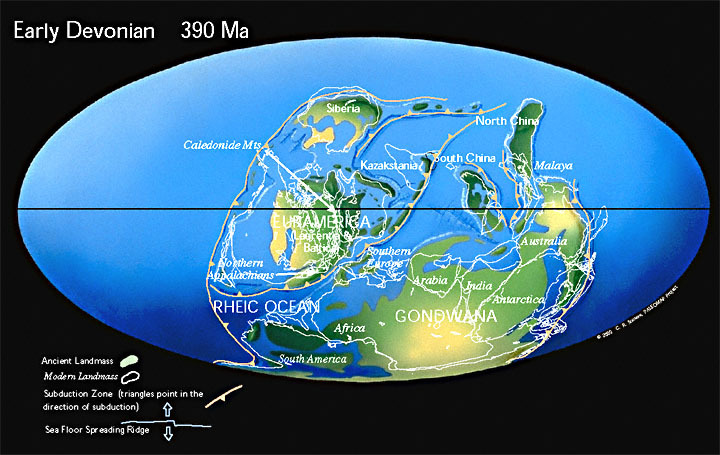 During the Devonian, there were three major continental masses: North America and Europe sat together near the equator, much of their current land underneath seas. To the north lay a portion of modern Siberia. A composite continent of South America, Africa, Antarctica, India, and Australia dominated the southern hemisphere. Paleogeographic reconstruction for the Devonian from Christopher Scotese’s excellent ‘Paleomap Project’. Early terrestrial arthropods, including wingless insects and the earliest arachnids. In the oceans, brachiopods flourished; crinoids and other echinoderms, tabulate and rugose corals, and ammonites were also common. Fishes are the dominent animals; scale tree forests appear on land, inhabited by the first wingless insects; blastoids are at their peak; the first ammonites and amphibians evolve. However, the Devonian is probably most noted for the diversification of rise to prominence of various groups of fishes; indeed this period is occasionally referred to as the "age of fishes." The vegetation of the early Devonian consisted primarily of small plants, the tallest being only a meter tall. By the end of the Devonian, ferns, horsetails and seed plants had also appeared, producing the first trees and the first forests. Archaeopteris is one of these first trees. The oldest lobe-fin fossil fish are Early Devonian, though the group likely appeared earlier. “The Devonian was pivotal in the evolutionary history of land plants: a diverse range of plant architectures evolved and plants radiated into a remarkable array of ecological niches (Gensel & Andrews 1984, Gerrienne et al. 2004, Stein et al. 2012). Numerous plant taxa have been reported from Devonian deposits around the world and phytogeographical provincialism began to develop in the global flora (see Raymond et al. 2006). However, plants with simple form and diminutive size, i.e., with axis widths less than 2 mm, from the Early–Middle Devonian, have been paid little attention (see Cai & Wang 1995, Wang & Berry 2003, Wang et al. 2004, 2007). Those basal euphyllophytes have quite distinct morphological characters in their branching patterns and sporangial attachment, and played key roles in the evolution of early land plants (Stewart & Rothwell 1993, Kenrick & Crane 1997)” (Xu et al. 2017, p. 524). Some of the several famous lagerstätten of Devonian age are briefly described below. Rhynie Chert: The Rhynie Chert in Scotland is an Early Devonian age deposit containing fossils of both Zosterophyllophytes and Trimerophytes, the two major lines of vascular plants. This indicates that prior to the start of the Devonian, the first major radiations of the plants had already happened. It has become famous as the oldest known terrestrial ecosystem fossilised in place. Hunsrück Schiefer (Hunsrück Slate): The Hunsrück Slate formation, originally and still mined for roofing slates, is one of the most important Devonian fossil localities known. Although the fossils are generally not spectacular in a manner which appeals to amateurs, the unusual preservation of soft tissue by pyritisation makes these rock a unique archive of scientific information. The rock is a marine sediment preserving the usual arthropods and molluscs, but also plants, sponges, vertebrates, and even extremely delicate forms such as ctenophores and chondrophorans. Achanarras Fauna (Scotland): “The classic Tynet Burn and Gamrie fish localities, in north-east Scotland are of Middle Devonian (Eifelian) age and have, since last century yielded beautifully preserved fossil fish, typical of the Achanarras fauna which occurs in deposits exposed to the south of the Moray Firth and to the far North. The fish are mostly preserved in calcareous concretions and despite the large quantities of specimens that have come from the sites, no special significance has been attributed to the material with respect to unnusual preservation. Current detailed work on newly collected material however, has identified new preservational potential for the fish bearing concretions. A number of rare specimens of acanthodians from both sites consistently exhibit dark traces within the body cavity which are analogous with the sites of internal organs in modern groups. Furthermore, dark ‘spots’ in the heads of acanthodians from Gamrie can be interpreted as the position of the eye. To date, these structures have only been observed in three acanthodian genera, but other groups are present and clearly there is potential for more work. A museum collection survey has been initiated and two more specimens, collected last century, have been located which exhibit internal organ site preservation” (Davidson & Trewin 1999). “The Frasnian-Famennian (F-F) faunal crisis represents one of the ‘Big Five Mass Extinctions’ in Earth History. Studies have been published that favor either a collision with an extraterrestrial bolide ... or changes in the oceanographic and climatic systems .... However, no unequivocal evidence on the origin of the Late Devonian faunal breakdown was reported. E.g. iridium anomalies reported from Australia ... and Southern China ... post-date the F-F boundary by 1.5 to 2 Ma. Microtekites from Belgium boundary sections ... were seen in context with the 368±1 Ma old Siljan Ring impact structure. However, the cosmic origin of these spherules has been questioned ... and the microtektites were found above the F-F boundary and clearly post-date the extinction event. Negative carbon isotope excursions were interpreted as evidence for a sudden biomass crash hat may have been triggered by a bolide impact .... In contrast, two positive δ13C excursions measured in the late Frasnian and at the F-F boundary ... seem not to support the idea of a dramatic decline in primary productivity. “The geochemical data base for the Late Devonian extinction event shows no evidence for a bolide impact as potential cause of the mass extinction. Instead, repeated changes in the carbon cycle of the ocean-atmosphere system are indicated by positive carbon excursions. The enhanced organic carbon burial is indicated by the higher δ13C values, deposition of the Kellwasser horizon and a positive excursion in δ34S of sulfides and organically-bound sulfur A decrease in atmospheric and oceanic dissolved CO2 contents is expected and may have culminated in global climatic cooling. A decrease in tropical seasurface temperature of 7°C is indicated by preliminary conodont and fish apatite δ18O data. “The paleontological data base seems to support the conclusion that climatic cooling may have represented a potential mechanism for the Late Devonian mass extinction .... Organisms living in the tropical to subtropical pelagic and shallow-water ecosystems were heavily decimated. Organisms thriving in higher latitudes or in deeper waters were only slightly affected. Further, late Frasnian faunal groups that were adapted to cooler temperatures migrated into tropical latitudes during the early Famennian. This pattern suggests that climatic cooling in conjunction with significant oceanographic changes may represent a powerful scenario to account for the Late Devonian mass extinction” (Joachimski & Buggisch 2000; ellipses replace numbered references in the original). Devonian rocks are rare in New Zealand. The best known and most accessible are to be found near Reefton, at Lankey Creek and Stoney Creek, where fossil brachiopods are relatively common. Some other animals, such as corals, also occur but they are less common. Very rare trilobites are also known. Cai, C.; Wang, Y. 1995: Devonian floras. In Li, X. (ed.) 1995: Fossil floras of China through the geological ages. Guangdong Science and Technology Press, Guangzhou: 28-77. Clack, J.A. 2002: Gaining ground: The Origin and Early Evolution of Tetrapods. Indiana University Press: 1-400. Davidson, R.G. ; Trewin, N.H. 1999: Unusual Soft Tissue Preservation in Middle Devonian Fish-Bearing Nodule Beds. Palaeontological Association 43rd Annual Meeting, University of Manchester, 19-22 December 1999. Gensel, P.G. ; Andrews, H.N. 1984: Plant Life in the Devonian. Praeger, New York: 1-381. Gerrienne, P.; Meyer-Berthaud, B.; Fairon-Demaret, M.; Streel, M.; Steemans, P. 2004: Runcaria, a Middle Devonian seed plant precursor. Science 306: 856-858. Long, J.A. ; Trinajstic, K.M. 2010: The Late Devonian Gogo Formation Lagerstätte - Exceptional preservation and diversity in early vertebrates. Annual Reviews of Earth and Planetary Sciences 38: 665-680. — 2018: A review of recent discoveries of exceptionally preserved fossil fishes from the Gogo sites (Late Devonian, Western Australia). Earth and Environmental Science Transactions of the Royal Society of Edinburgh 108: 111-117. Raymond, A.; Gensel, P.G. ; Stein, W.E. 2006: Phytogeography of late Silurian macrofloras. Review of Palaeobotany and Palynology 142: 165-192. Schultze, H.-P.; Cloutier, R. (ed) 1996: Devonian fishes and plants of Miguasha, Quebec, Canada. Verlag Dr. Friedrich Pfeil, Munchen: 1-374. Sedgwick, A.; Murchison, R.I. 1839: On the physical structure of Devonshire, and on the subdivisions and geological relations of its older stratified deposits. Transactions of the Geological Society of London, Series 2, no. 5: 633-704. Selden, P.A. ; Shear, W.A. ; Bonamo, P.M. 1991: A spider and other arachnids from the Devonian of New York, and reinterpretations of Devonian Araneae. Paleontology 34 (2): 241-281. Shear, W.A. ; Bonamo, P.M.; Grierson, J.D. ; Rolfe, W.D.I. ; Smith, E.L.; Norton, R.A. 1984: Early land animals in North America: evidence from Devonian age arthropods from Gilboa, New York. Science 224 (4648): 492-494. Stein, W.E. ; Berry, C.M. ; Hernick, L.V.A. ; Mannolini, F. 2012: Surprisingly complex community discovered in the mid-Devonian fossil forest at Gilboa. Nature 483: 78-81. Stewart, W.N. ; Rothwell, G.W. 1993: Paleobotany and the Evolution of Plants. Cambridge University Press: 1-521. Wang, Y., Xu, H., Fu, Q.; Tang, P. 2004: A new diminutive plant from the Hujiersite Formation (late Middle Devonian) of North Xinjiang, China. Acta Palaeontologica Sinica 43: 461-471. Wang, Y.; Berry, C.M. 2003: A reconsideration of Dimeripteris cornuta Schweitzer and Cai, a diminutive fossil plant from the Middle Devonian of Yunnan, China. Geobios 36: 437-446. Wang, Y.; Berry, C.M. ; Hao, S.; Xu, H.; Fu, Q. 2007: The Xichong flora of Yunnan, China: diversity in late Mid Devonian plant assemblages. Geological Journal 42: 339-350. Xu, H.; Wang, Y.; Tang, P.; Wang, Y. 2017: A new diminutive euphyllophyte from the Middle Devonian of West Junggar, Xinjiang, China and its evolutionary implications. Alcerhinga 41 (4): 524-531.